We are delighted to announce the opening of our brand new 3 acre CPCS plant training and testing centre in Birmingham. The new training and test centre is situated off a main road in the heart of Birmingham, less than 5 minutes from the M6 and connecting motorways and within a 15 minute drive of Birmingham City Centre. The training and test centre facilitates a fully accredited touch screen health & safety test centre, the use of 2 classrooms and a whole host of plant machinery to include digger, dumper, 360 excavator, telehandler & Cranes. Central Construction Training is an approved CPCS test centre and accredited NPORS training provider. In addition to this we are an accredited EWPAR ‘Experienced Worker Practical Assessment Route’ NVQ centre and accredited under the OSAT ‘On-Site Assessment and Training’ route to NVQ. The two schemes we operate for plant training/testing gives you the choice to decide which is the most effective and suitable solution for your business needs. Once you gain your red CPCS trained operator card it is valid for 2 years. Within this period you must successfully complete a National Vocational Qualification (NVQ) in every category you hold on your red card. 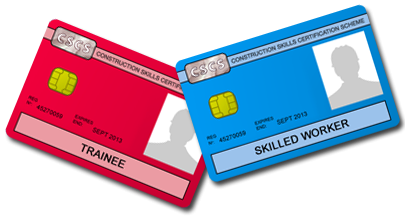 You can then apply to CPCS with copies of your NVQ certificates in order to gain you Blue CPCS Competent Operator Card. Being an accredited EWPAR centre offers massive advantage to our customers ensuring that learners have the option to complete their NVQ qualification whilst they are at our training centre and progress straight from red trained operator card to a blue skilled competency card without delay. If EWPAR is not your preferred option we are also a fully accredited provider of OSAT ‘On Site Assessment and Training’ NVQ’s meaning we can enrol you straight onto your NVQ so you can progress to the blue card at your own pace with the guidance and coaching of our experienced assessors who will come out to visit you at your place of work. Our training courses will ensure that your operators are safe and efficient in their jobs and working in line with the very latest legislation. Putting it simply, holding a CPCS card will get you on any site in the UK as a plant operative. Fully trained operatives will help secure your future. Central Construction Training Ltd pledge to offer a complete end to end service. From enrolment through to CPCS card applications we are on hand to offer guidance and support as well as a truly professional and occupationally competent assessment. Our expert trained bookings and administration team are constantly available to offer support and advice. We are dedicated to offering the best customer service so if you have a particular requirement speak to us and we will do our best to assist you. We are here to offer you the best advice and support on taking the CITB touch screen test, gaining you CPCS card and progressing through the scheme. Need a 360 excavator but don’t require the whole 10 day training? Require a telehandler course but you can’t afford the 4 day down time? With many CPCS training centres offering extended and timetabled training courses, many employers and individuals are suffering the costs and loss of work time in attending training courses that are not specifically tailored to their needs just because it is the only course available. Our bespoke service delivery ensures that our customers will only pay for the training they require. We can tailor all our training packages to ensure you get the exact amount of training you require before you do the CPCS test. If you are very experienced and you only require the CPCS test that is okay too. Speak to our expertly trained and friendly booking team about your training requirements and see how we can maximise the benefits of the training experience by ensuring a wholly individual and bespoke approach to our service and delivery. Our partnership networks and alliances help ensure we can access as many sources of funding as possible. Our own funding contract will provide a substantial relief toward the cost of your training and tests. In addition to this we are experts in CITB grants and we will help ensure that all CITB levy paying customers maximise the benefits of the scheme by claiming the maximum grant allowance for each item of plant they require. The fact that we own most of our machinery means we can deliver the training to our clients at highly competitive rates. Where we do require plant machinery hire, we work in partnership with many local hire companies to ensure, not only the quickest and most efficient service, but also vastly discounted rates which we can pass onto our customers. We remain committed to being competitive on pricing whilst ensuring the quality of our training and delivery continues to be outstanding. The National Plant Operators Registration Scheme (NPORS) accreditation offers something a little different to CPCS. Whilst it not as widely recognised as CPCS, it is gaining popularity with contractors due to the flexibility of the scheme and some of the more specialist categories of plant it offers for testing. With NPORS, we can come and test your candidates on site rather than bringing them into the test centre. This is particularly useful where transport is an issue for a candidate or where the workforce cannot operate without a ‘full gang’ so having one person away disrupts work too much. Please contact if you are interested in the NPORS route. We will advise you which is the best scheme for you based on your needs and what you want to achieve.